As the living populace grows adjusted to the zombie menace, more and more zombie signs like the ones found here will start to pop up. 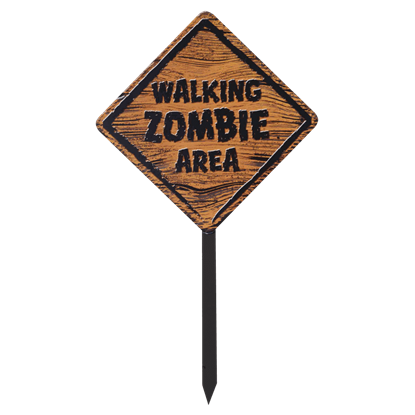 The task of exterminating zombies is a daunting prospect, so these zombie apocalypse signs will warn others of zombie territories in the meantime. 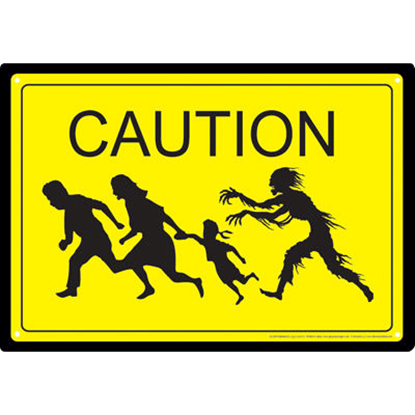 We offer zombie road signs like caution signs, Dead End signs, zombie crossing signs, and zombie shelter signs. 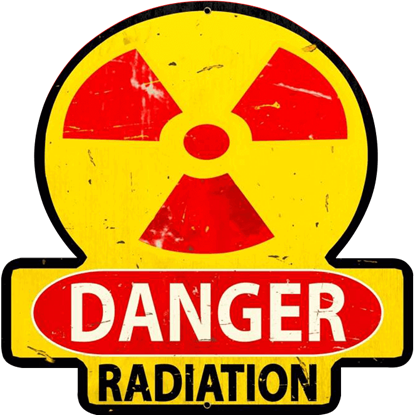 Additionally, we carry warning signs for other apocalypse threats like biohazard signs, radiation signs, fallout shelter signs, and other danger signs. Our zombie humor signs offer a way to lighten the mood, featuring options like zombie welcome signs, Keep Calm signs, and vintage zombie comic signs. If all of these designs are still not enough, then you are in luck. 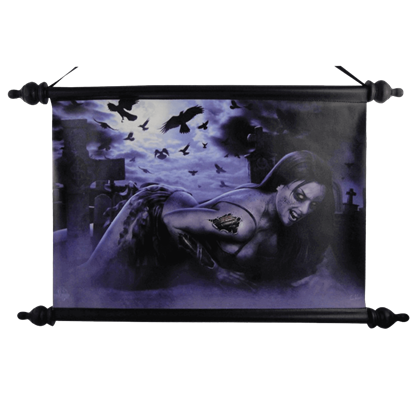 We also provide a range of other zombie wall art like zombie posters, zombie banners, and zombie scrolls to decorate your walls. All of these pieces look great at Halloween or any time of year when you want to show off some zombie decor! If there is one thing to be truly wary of, it is a biohazard. 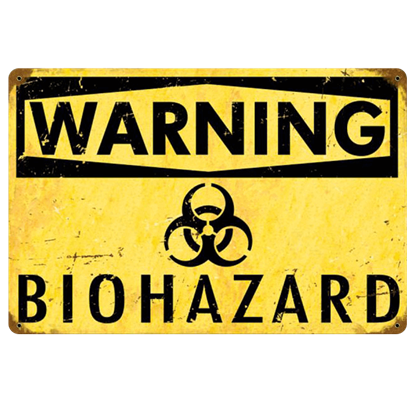 Luckily, with this Biohazard Warning Sign, you can create awareness and hopefully avoid any possible world-altering disasters like mutant uprisings or zombie outbreaks. Do you feel a prickle running down your back when you see the glaring colors of the radiation trefoil? This Danger Radiation Metal Sign makes an unsettling piece of decor for your home, giving it the feel of a nuclear warzone. 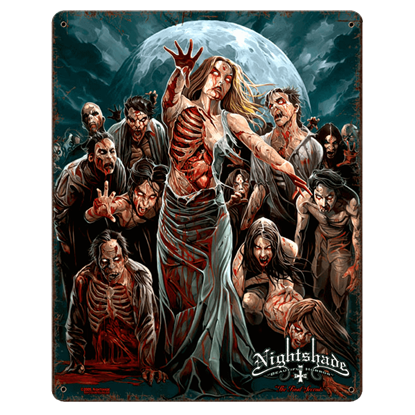 The Final Seconds Vintage Gothic Sign depicts the sight that many see during the days of the zombie outbreak - an oncoming horde of hungry half-decayed zombies mere seconds before they descend upon terrified prey in a feeding frenzy. 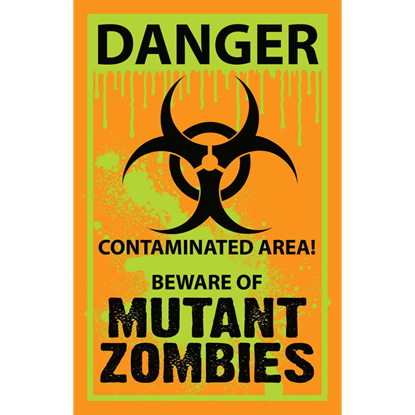 Before a zombie apocalypse, you would almost never see a sign like this Mutant Zombies Warning Sign. But after a zombie outbreak of catastrophic proportions, signs like this one will become all too common. Make sure everyone is prepared to take basic safety precautions after the zombie apocalypse occurs by posting warning signs like this one. The Zombie Caution Metal Sign serves as a fantastic reminder to keep an eye out for the undead. 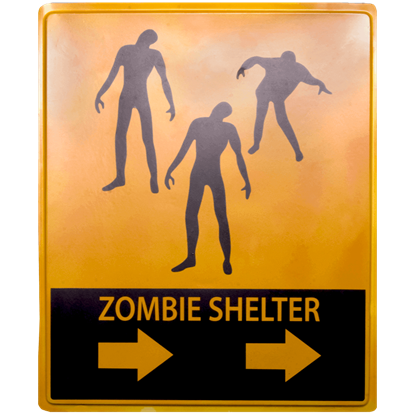 The Zombie Shelter Sign is a great way to lend a helping hand to your fellow man when the dead rise as zombies. This sign has the look of a road sign, so it could easily be mistaken for one if it was not for a few key differences. The polite thing to do when you know there are zombies in the area is warn your neighbors. What better way to do that than putting the Zombie Warning Sign up in your yard? The sign is eye-catching and easy to put up.